The RCPM Series Display Panels provide a visual and audible alarm in the event of a pump run-time exceeding a pre-set limit, typically indicating a suspected leak or over-use due to an outlet being left open, faulty control system, or disconnected pipework. As standard, the visual indicators include a green light indicating that the pump is live, and a red light with audible alarm indicating excessive run-time. RCPM can also be wired into some automatic pumps wherever it is possible to obtain a return live from the pump’s common motor pole. 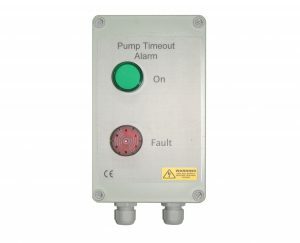 In the case of automatic pumps by using this alarm it is possible to gain advance warning of unintended overrunning due to poor installation, limiting the potential for damage to the pump itself. Options available for outputs into Building Management Systems (BMS) and to auto-shut off the pump when the alarm is triggered. The control panel must be installed in a sheltered location. It can be mounted in outside as long as it is protected from the weather for example in a barn or covered area. The maximum time duration achievable is 24 hours, and minimum is 0.1 seconds. We would generally recommend a setting of between 20 minutes and 2 hours depending on expected usage, although commercial and industrial installations may expect longer periods of continuous use and so require a longer delay.